Increasing the returns that can be earned from the strategy’s buy and sell signals. Hood River Research (HRR) offers a customized service that takes the second approach. The return of your strategy is increased by predicting which signals are likely to be the most and least profitable, thereby allowing you to take larger positions on signals with the highest expectations and smaller positions on those with the lowest expected returns. The predictions are based on indicators that quantify the trading dynamics of a security at the time your strategy issues a signal to initiate a position. Hood River’s process relies on sophisticated data preprocessing and an ensemble of non-parametric modeling techniques designed to uncover patterns invisible to less powerful modeling methods. The deliverable is a performance boosting model, which is a second-stage prediction model, designed to work in conjunction with your existing strategy. Past projects have shown that signals predicted to generated the highest returns produce gains that are 1.5 to 3 times larger than average signal returns while signal predicted to perform poorly can have negative expected returns. To clarify the knowledge conferred by the second-stage model, consider the knowledge possessed by the investor not using one. Suppose this investor employs a low-PE strategy. Each month all stocks in the investor’s universe are broken into deciles based on their PE ratio. A typical strategy would be to buy the stocks in the lowest PE decile (decile 1). Assume that a historical back-test of the strategy has shown that stocks in the lowest PE decile produce an excess return versus the universe of 0.50% over the one month period following purchase. From this investor’s state of knowledge, all that can be said each time the low-PE strategy signals the purchase of a security is that it has an expected one month excess return of 0.50%. All other information about the security is being ignored  information that might help the investor to refine their expectation of the signal’s return. Now let’s consider another investor who follows the same low-PE strategy but who is using a performance boosting model customized for the low-PE strategy. For ease of illustration, we will assume that its predictions are based on only two predictor variables (indicators): #1, the RSI indicator and #2 is VOL_CHG, the recent rate of change in the stock’s trading volume. When the low-PE strategy issues a buy signal for a particular stock, the values of these two indicators for this stock become the inputs to the boosting model. 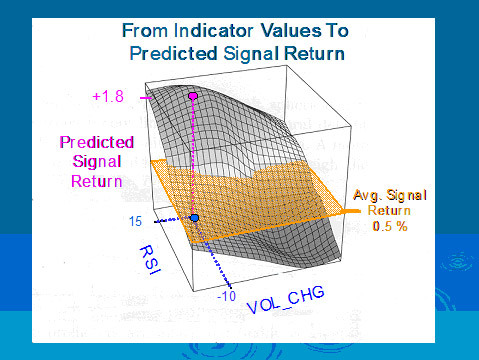 Let’s suppose that as of the date of the buy signal RSI has a value of 15 and VOL_CHG has a value -10. Note in the diagram below these two values specify the coordinates of a point (blue dot) in a two-dimensional space, where one dimension represents RSI and the other represents VOL_CHG. Note that this location in the indicator space is associated with a specific point (purple dot) on the nonlinear surface floating above the 2-d indicator space. This location has an altitude of +1.8% with respect to the vertical or third dimension which represents the predicted return for the signal. Thus, +1.8% is the predicted return for this signal. It can be said the shape of the surface floating above the 2-dimensional indicator space depicts the relationship between these indicators and the predicted return for the signal. While this example was limited to two predictors so that the third dimension could be used to represent the signal return, in practice performance-boosting models may contain numerous predictors. In the diagram the knowledge of the investor operating without the boosting model is represented by the level flat orange surface. It has a uniform altitude of +0.5%, irrespective of the value of either indicator or any other variable for that matter. This is simply another way of saying that the investor without the boosting model always expects (predicts) the same outcome on each signal, its historical average return of +0.5%. In contrast, the knowledge of the investor using a boosting model is represented by the non-linear surface. This investor brings a greater variety of information to bear in deciding what size position to take on any given signal. David Aronson is an adjunct professor of finance at Baruch College, City University of New York, where he teaches a graduate level course in quantitative market analysis and data mining. He is a Chartered Market Technician and has been involved in the application of advanced data analysis and modeling to financial markets since 1982 when he founded Raden Research Group, an early adopter of machine learning financial market forecasting. He was a proprietary trader with Spear Leeds and Kellogg and founded AdvoCom, a firm that specialized in the evaluation of commodity trading advisors and hedge funds. He is author of the book: Evidence Based Technical Analysis: Applying the Scientific Method and Statistical Inference to Trading Signals (Wiley 2006). Timothy Masters, has a PhD in statistics and has been active in the application of advanced data modeling and machine learning methods to various areas of prediction including military, medical and financial applications since 1978. Dr. Masters has developed a suite of proprietary software that is used by Hood River in its performance boosting service. He is author of four books including: Practical Neural Network Recipes in C++ (Academic Press 1993), Signal and Image Processing with Neural Networks. (Wiley 1994), Advanced Algorithms for Neural Networks (Wiley 1995), Neural, Novel, and Hybrid Algorithms for Time Series Prediction. (Wiley 1995). © Copyright 2007 Hood River Research. All rights reserved.